At the time, the 1990 NFL draft was considered to have one of the best and deepest defensive end classes in memory. It was led by Alabama uber-propsect Keith McCants (thought by many to be #1 overall prospect in the entire class), and had a lot of other high-profile college standouts. In retrospect, the class was a near total flop. Two of the best DE’s were snagged by Bill Belichick and the Cleveland Browns – Anthony Pleasant in the 3rd rounder and hidden gem Rob Burnett in the 5th. Drafted 129th overall, and the 17th DE to come off the board, Burnett played in more games (202) than any DE other than Pleasant (who also played in 202). He piled up 73.5 sacks in a 14 year career and played the run as well as he rushed the QB. Even as his career neared its end, Burnett managed to have an impact – in 2000 he racked up 10.5 sacks, 3 forced fumbles and 5 fumble recoveries on the Ravens’ historic Super Bowl winning defense. 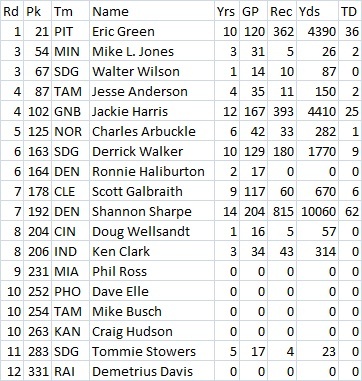 Of the 35 DE’s selected in 1990, only Burnett (10) and Pleasant (11) were full time starters for more than 6 seasons. 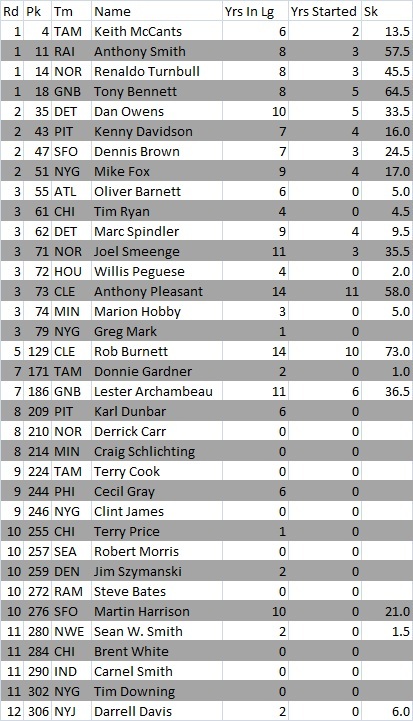 Burnett is has the 5th most sacks for a 5th rounder and was 20th in total sacks between 1990-2000. Casillas was useful, but never lived up to the expectations that come with being the 2nd overall pick. Jon Hand had 10 sacks in in 1989 but never had more than 5 in his 7 other seasons as a starter. 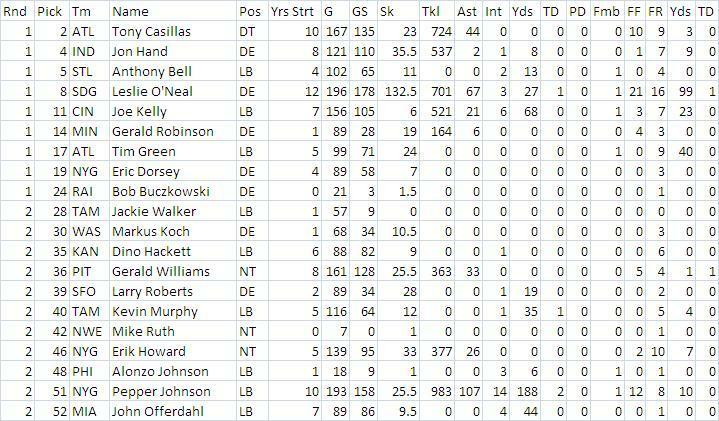 Joe Kelly, Gerald Williams and Erik Howard were useful players and Offerdahl was one of the best LB’s in the game but couldn’t stay healthy and was out of the league by the time he was 29 years old. The rest never amounted to much. 1st rounders Dorsey, Robinson, Green and Buczkowski were all pretty much busts. The Eagles’ Alonzo Johnson (drugs) and Patriots’ Mike Ruth (knee injury) were out of the league within 2 years. Pat Swilling (60th) and Charles Haley (96th) turned out to be premier pass rushers. Tim Harris was perhaps better than either, (and on his way to a Hall of Fame career) posting 13.5 sacks in 1988, 19.5 in 1989 and 17 in 1990 before drug, alcohol and injury problems pushed him out of the league. Phillips was a long-time starter at NT, Fagan and Brent Williams were useful contributors and Mark Pike is the (unofficial) all-time leader in special teams tackles. But the team that really hit it rich in the 1986 draft was the Philadelphia Eagles. They landed two hidden gems, first grabbing Seth Joyner (8th round, 208th overall) and then landing borderline Hall Of Famer DE Clyde Simmons with their next pick (9th round, 233rd overall). Both guys, benefiting from playing under top defensive coordinators Wade Phillips (1986-88), Jeff Fisher (1988-1990) and Bud Carson (1991-1994), anchored an Eagles defense which was consistently a top-10 unit. Joyner enjoyed a 12 year career and is the only player in NFL history to record more than 50 sacks and 20 INTs. 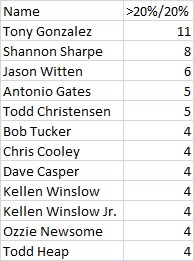 To put that in perspective, only six 50+ sack players have even gotten to 10 INT’s (Joey Porter is the only active such player with 98 sacks and 12 INT). Simmons led the league in sacks with 19 in 1992 and was a 1st team All Pro in back to back seasons (1991 and 1992). Other late rounders included special teams player Garth Jax, reliable starter Kurt Gouveia (best known for his INT in Super Bowl XXVI) and journeyman starter Jesse Solomon. Ultimately, most of the top prospects in the 1986 draft didn’t work out the way their teams had hoped, but the later rounds produced four of the best pass-rushers of that era and a number of solid starters. Most serious NFL fans know the story of Tom Brady: drafted in the 6th round (199th overall) in 2000, he epitomizes the idea that great players can be found in the late rounds of the draft. In fact, it’s nearly impossible to win a Super Bowl without getting some big contributions from the guys taken long after the big name prospects come off the board (or not taken at all). The 2010 Super Bowl champion Green Bay Packers featured a number of such players: longtime WR Donald Driver (7th round), starting ILB Desmond Bishop (6th round), Pro Bowl starting CB Tramon Williams (undrafted) and valuable nickel back Sam Shields (undrafted). Hidden Gems is my look at guys who slipped through the cracks on draft day for various reasons (too small, too slow, small school, etc) and went on to have a lot of success in the league. While the odds of finding the next Sharpe are minuscule, the average draft has 3-4 solid hidden gems just waiting to be unearthed by a scout, personnel man or general manager. 2011 yielded Denarius Moore (148th overall), 2010 produced Cody Grimm (210th), David Gettis (198th), James Starks (193rd) and Antonio Brown (195th). Who will be 2012’s late round surprise?